I was excited when BMW dropped of their brand-new BMW i3 for me in Camden Town - this is the world’s first fully networked electrically powered car after all! Now, I can honestly say I love cars as much as the next person, but I can’t claim to be car savvy - my knowledge of the internal workings of any type of car is practically non-existent! However, the purpose of my test drive was never about the engineering or mechanical side of the car but about the fact that it is powered by electricity rather than fossil fuels, therefore it doesn’t produce any pollution when driven. Its Lithium-ion battery has one of the best ranges on the market – approx. 100 miles (without the range extender), and this lightweight battery stores more energy which improves its environmental efficiency. Immediately obvious (even to me) is that this car is attractive inside and out, it has a sleek design, a spacious interior and state of the art electronics including a built-in navigation system. The doors are child-proof – the rear doors will not open if the front doors are open, they also open the opposite way to the front doors so if you have young children, you can fit seats or bumper seats and get children in or out with ease. I decided to put this car to the test with a long-distance drive to my home town of Liverpool. The fact that it can cover (approximately) 200 miles and emit zero driving emissions is incredible, so I couldn’t wait to try it out. There are lots of charge points that are connected to the national power grid but that means that you can’t always guarantee where the power is coming from when charging your car, so it is a good idea to do some research before setting off on a long journey. I came across a company called ecotricity who have rapid charge points all over the UK’s main fuel stations. 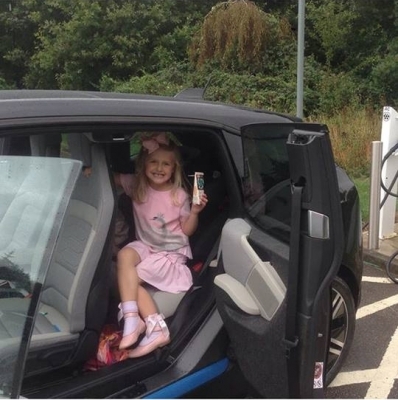 What sets them apart is that they use 100% renewable electricity and if you are an ecotricity customer, you don’t pay to use the charge points, which would mean a 200-mile trip like mine from London to Liverpool would cost the princely sum of … Zero! (or £6 per charge if you are not a customer). My journey began from London’s greenest hotel Qbic In Adler Street, East London, they kindly charged the car for me overnight at one of their two free charging points. So, with a fully charged battery I set off and headed for the motorway out of London. The drive was smooth, comfortable and dare I say fun? The GPS navigator is easy to control so I synced my tunes to the Bluetooth and sang along loudly (as you do when you’re driving alone). The acceleration on this machine goes from 0-35 mph in 3.5 seconds and from 0-60 mph in about 7 seconds, I loved it and found myself deliberately slowing down a couple of times just to go fast again! I had estimated that I would probably need to charge the car when I got to Birmingham, but when I arrived at the charge point I was disappointed to find the rapid charge point wasn’t working and neither was my phone signal! Without WIFI to locate the nearest point myself, I had to find a public phone to speak to their helpline and find out where the next one was. I arrived at the next charging station soon after but frustratingly, I had no phone signal again (the brilliance of o2 outside of London)! so I was unable to access the ecotricity app needed to charge the car and again, I had to find a public phone to speak to someone from ecotricity, luckily they were able to turn on the rapid charge point digitally for me. A quick 30 minutes was all it took to charge the car and a few hours later I arrived in Liverpool, showing off the shiny black BMW to family. Overall, despite having a few setbacks with the charging points - which temporarily altered my mood from elated to deflated, I have nothing but praise for the BMW i3. I had a comfortable and pleasurable drive in a top of the range car that offers brilliant performance and agility, where engine noise is eliminated and best of all for me personally, it doesn’t produce tailpipe emissions like cars powered by fossil fuels, so it does not emit harmful noxious fumes. As our business promotes all things organic and eco-friendly, I was more than suitably impressed! Visit BMWi for more info on their amazing electric fleet.